The Ford Pinto was Ford Motor Company’s entrance into the subcompact car market in the 1970s. With the rising popularity of imported Japanese and German vehicles, which were often smaller and more fuel efficient, beginning to push into the dominance of American automakers’ share of the market, Ford designed the Pinto as a viable alternative. 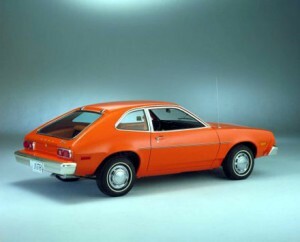 The Pinto was fairly popular, selling more than 3 million units during its production span. Unfortunately, an element of the Pinto’s design made it susceptible to serious damage if involved in an accident. The fuel tank was not properly constructed, and in even minor rear-end collision accidents, the filler neck might break and release fuel, resulting in deadly fires and explosions in some accidents. More damningly, an internal memo which had been circulated among Ford’s executive directors was obtained by Mother Jones magazine in 1977, showing that the company had not only been aware of the design defect but, after conducting a cost/benefit analysis determining that fixing the defect would cost around $11 per vehicle, had concluded that it would be more cost-effective to simply allow the defective vehicles to remain on the market and settle any legal actions which might later be brought. The first lawsuit brought against the Ford Pinto, Grimshaw v. Ford Motor Company, demonstrated just how devastating the consequences of this product defect could be. Lily Gray and 13-year old Richard Grimshaw were traveling in a Ford Pinto when the vehicle was struck by another car, at the relatively low speed of 30 miles per hour. However, because of the defective fuel tank design, the vehicle burst into flames, killing Lily and severely injuring Richard. With the assistance of an experienced product liability attorney, Grimshaw and the Gray family sued Ford Motor Company, resulting in compensatory damage awards of $560,000 for the Grays and $2.5 million for Richard Grimshaw. As a result of the corporate memo, however, the jury also assessed punitive damages against the Ford Motor Company for a total of $125 million. While these damages were eventually reduced to a much more reasonable sum, they demonstrated the considerable public disapproval that Ford’s actions had incited. Further cases were brought against Ford throughout the 1970s, eventually resulting in the discontinuation of the Pinto line in the early 1980s. While this case is an especially devastating example of the dangers that product liability can pose to the general public, many other types of product defect cases in the United States have helped to hold manufacturers accountable for the consequences their actions can have. This entry was posted in Accident Case Studies, Product Liability and tagged Product Liability on January 11, 2013 by Philbin.